Probiotics are often taken with oral antibiotics to help prevent nausea and diarrhea induced by killing off the "good" along with the bad bacteria within the digestive tract. It is now known that just as with the digestive tract, the sinuses also require "good" bacteria to remain healthy. With too much antibiotic use, the sinuses become depleted of all the good bacteria allowing for the bad germs to trigger another sinus infection leading to a cycle of recurrent sinusitis. Only in the past few years, this recognition has initiated research to find a way to administer probiotics effectively into the sinus cavities and replenish a normal healthy flora of good bacteria. There are anecdotal reports in which patients have rinsed juices from fermented vegetables with success. But given the pungent smells associated with fermented vegetable juices, its appeal is very limited. However, a new product is now available for purchase that is not any worse than performing plain saltwater flushes to the nose. 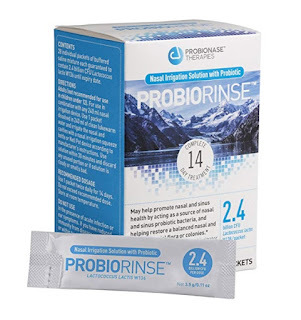 Called ProbioRinse, a patient suffering from chronic sinusitis can flush probiotics directly into the nose using any 240ml nasal rinse kit (ie, netti pot, neilmed sinus rinse bottle, etc). This product contains a probiotic bacteria called Lactococcus lactose W136. Each pre-mixed saline packet contains 2.4 billion colony-forming units (CFU). Each package comes with 28 packets to allow for twice-a-day treatments for 2 weeks and can be purchase on Amazon. Based on a small Canadian pilot study on 24 patients, it does seem to be effective. And, it can't hurt to give it a try. Logically, this nasal rinse product will probably work better in patients who have already undergone sinus surgery, but given it is bacteria which can grow and spread, it is also conceivable that it may also work in patients who have not yet undergone sinus surgery. Its effectiveness is also probably more limited in those patients who suffer from "complicated" sinusitis such as those who ALSO suffer from severe allergies, nasal polyps, Churg-Strauss Syndrome, etc.